AVO reported that during 3-9 September seismic activity from Kasatochi, detected by stations approximately 40 km W on Great Sitkin island, was low. Vigorous steam-and-gas plumes that rose above the crater and drifted up to 32 km downwind were observed on 3 and 4 September by passing mariners. On 4 September the Volcano Alert Level was lowered to Advisory and the Aviation Color Code to Yellow. Clouds mostly prevented satellite image observations; weak thermal anomalies were detected on 5 and 7 September. Our last report on Kasatochi discussed the eruption of 7-8 August 2008 (BGVN 33:07). Since the 2008 eruption, the volcano has remained quiet except for gas emissions. Erosion and deposition of erupted pyroclastic material are rapidly altering slopes and beaches on the island (Scott and others, 2010). This report highlights studies conducted during 2008-2009 of the uninhabited island. Alaska Volcano Observatory (AVO) still monitors Kasatochi (figure 8) indirectly from the Great Sitkin Island seismic network located 42 km away and from satellite imagery. After the 2008 eruption, and the associated almost total biosystem extinction in 2009, Kasatochi Island became a site for monitoring ecosystem succession. Figure 8. Map showing the location of Kasatochi in the Aleutian Islands. The extent of ash fall from the 7-8 August 2008 eruption is represented by dots with unverified areas indicated by question marks. Courtesy of Alaska Science Center (DeGange, 2010). The terrestrial and surrounding marine environments of Kasatochi Island examined in June and July of 2009 saw changes in abundance or distribution of the ecosystem when compared to patterns observed on earlier surveys conducted in 1996 through June 2008. The largest direct effect of the eruption to individual animals was probably mortality of young birds. Indirect effects on wildlife consisted of the loss of suitable foraging habitats for species that relied on former terrestrial, intertidal, or nearshore-subtidal habitats and the near-total destruction of all former nesting habitats for most species. Although several species attempted to breed in 2009, all except Steller's sea lions failed due to the lack of suitable breeding sites. The 7-8 August 2008 eruption. One or more of six remote International Monitoring System (IMS) infrasound arrays (figure 9) detected three well-defined eruption pulses of the 7 August 2008 eruption. The first was an infrasonic very long period (IVLP) acoustic pulse (pulse 1) that began at 21:59:44 UTC on 7 August with a gradual onset and duration of ~123 min and a peak RMS pressure of 0.22 Pa. The acoustic origin time was consistent with that computed for seismic signals (22:01 UTC). Pulse 2 began at 01:34:44 UTC on 8 August with a more impulsive onset, a duration of ~59 min and a peak RMS pressure of 0.46 Pa. Pulse 3 started at 04:20:34 on 8 August with an RMS pressure slightly higher than pulse 1 but lower than pulse 2 and a duration of ~33 min. Figure 9. Kasatochi's 2008 eruption generated infrasonic signals detected by at least one of these six International Monitoring System (IMS) numbered stations (Fee and others, 2010). The formerly steep and rugged island which previously had dense low-growing vegetation similar to other Aleutian Islands (figure 10a), became visibly devoid of vegetation after the 7-8 August 2008 eruption (figure 10b). In brief, the island habitat appeared to have been destroyed. Figure 10. Kasatochi island as viewed before and after the 7-8 August 2008 eruption. (a) Aerial image from 9 July 2008 looking S showed extensive vegetation. (b) Aerial image from 23 October 2008 looking E showed pervasive pyroclastic material mantling the island. By this time, a shallow, gray, acidic lake had reformed in the widened summit crater. Photographs taken by Jerry Morris, Security Aviation; (from Waythomas and others, 2010). Table 1 compares physical measurements of the island on 9 April 2004 (4 years prior to the 7-8 August 2008 eruption) to those taken on 17 September 2008 (nearly 6 weeks after the eruption). The aerial extent of the island increased by 40% after the eruption, the crater area increased by 25%, and the lake surface area enlarged by 73%. The accumulation of pyroclastic debris (most visible to the right in figure 10b) resulted in the seaward extension of the entire coastline by about 400 m, thus increasing the diameter of the island by about 800 m.
Table 1. Kasatochi Island's physiographic changes resulting from the 7-8 August 2008 eruption. *Data from 18 April 2009 Quickbird image. Reproduced from Waythomas and others (2010). Post-eruption geology - eruptive deposit studies. Waythomas and others (2010) performed tephra studies in summer 2009 and reported that the bulk of the eruptive products from the 2008 eruption were pyroclastic-flow deposits, produced mainly by phreatomagmatic activity. The eruption lasted ~24 hours and included two initial explosive pulses and pauses over a 6-hr period that produced ash-poor eruption clouds, a 10-hr period of continuous ash-rich emissions initiated by an explosive pulse and punctuated by two others, and a final 8-hr period of nearly continuous ash emission and intermittent phreatic and phreatomagmatic activity. The authors reported that the eruption "...resulted in the accumulation of a uniform cover of medium gray-brown fine ash and pyroclastic-surge deposits over all flanks of the volcano. These deposits are 2-3 m thick and consist of silt, fine sand, and granules that are easily eroded by channelized water flows, and turn to sticky muck when wet." The deposits included a basal muddy tephra from eruptions through the shallow crater lake and accidental lithic debris derived from pre-existing lava flows in the crater. The juvenile material, which accounts for about 20-50% of the volume of the deposits, is pumiceous andesite (58-59% SiO2). Surface erosion on the slopes of Kasatochi volcano determined the transfer of sediment to the marine environment and is largely a function of the local hydrologic conditions. Analysis of satellite images and field studies in 2008 and 2009 have shown that within about one year of the 7-8 August 2008 eruption, significant geomorphic changes associated with surface and coastal erosion occurred (figure 11). Figure 11. Cliffs eroded by wave action on an ENE shoreline of Kasatochi, photographed on 12 June 2009. Courtesy of AVO. Although technically, sizes of rills and gullies differ, Waythomas and others (2010), using 1 m resolution imagery, could not resolve the size difference; thus they defined both as a narrow, relatively deep, v-shaped or rectangular gully on a hillside formed by flowing water. They observed extensive gully erosion beginning shortly after the eruption and continuing thereafter. Gully erosion removed 300,000 to 600,000 m3 of mostly fine-grained volcanic sediment from the flanks of the volcano, much of which reached the ocean (figure 12). Figure 12. Images of erosion into pyroclastic deposits from the 7-8 eruption of Kasatochi. (A) The gully pattern that developed on the SW flank (person for scale indicated by arrow). (B) Looking in an E flank gully; maximum gully depth is ~3 m. Courtesy of Waythomas/AVO. As seen during the summer of 2009 (Scott and others, 2010), the 2008 volcanic deposits that mantle much of the island mainly consisted of decimeter-thick veneers. Veneers greater than 10 m were found locally on middle-to-upper flanks. Broad aprons and fans up to several tens of meters thick were found along much of the lower flanks below former sea cliffs. Fans originally extended out to 460 m from the former sea cliffs, but by the summer of 2009, fans on the W, N, and E flanks had been truncated to about half that distance or less by coastal erosion. They terminated in active sea cliffs about 15-20 m high. Fans on the S-side of the island either terminated in low cliffs or, more typically, were buried by post-eruption fans of alluvium and debris-flow deposits or by accreting beach sediments that displaced the shoreline an additional 150-250 m seaward. Post-eruption habitat - vegetation studies. Talbot and others (2010) searched Kasatochi Island for remnant vegetation and signs of re-vegetation at pre-eruption sampling sites. Plants that apparently survived the eruption dominated early plant communities. The most diverse post-eruption community resembled a widespread pre-eruption community. Figure 13 shows a representative plot containing 11 species assigned to bluff ridge vegetation type that inhabited wave-cut cliffs prior to the eruption. Although this ridge vegetation type is nominally species-poor, in this sampling, the mean-species diversity was generally higher than the other post eruption types (Talbot and others, 2010). Figure 13. A representative plot of 11 species assigned to bluff ridge vegetation type that existed on wave-cut cliffs prior to the 7-8 August 2008 eruption. Photo by Lawrence Walker, UNLV; courtesy of Talbot and others (2010). Jewett and others (2010) examined the subtidal zone and reported that algal and faunal communities as well as rocky substrates were buried with volcanic deposits from the Kasatochi 2008 eruption. Existing plants were buried and the former stable rocky habitat was buried well into the subtidal zone. The loss of this rocky habitat may constrain kelp recolonization. However, little information is known regarding ocean current directions and velocities that may ultimately help erode soft-sediments and expose the hard rocky substrates necessary for kelp bed recolonization. Higher trophic marine organisms (for example, phytoplankton, the photosynthesizers that provide energy for a vast number of primary consumers, which in turn provide energy for secondary consumers and decomposers) were also affected by the eruption. Post-eruption habitat - arthropod studies. A 2009 field campaign recorded 17 post-eruption insect species presumed to be non-breeding survivors and 4-9 breeding species. By 2010, 7 of the species seen in 2009 were lost while 18 post-eruption species survived, most of which were breeding (Ridling, 2012). The arthropod, Agyrtidae: Lyrosoma opacum Mannerheim (figure 14) was found to be the only breeding beetle among the 4-9 species found on post-eruption Kasatochi during the 2009 campaign. Figure 14. During the 2009 field campaign one beetle species remained breeding on Kasatochi (Agyrtidae: Lyrosoma opacum Mannerheim) as seen the on remains of an unidentified bird species. From Ridling (2012). Post-eruption habitat - avian and mammalian studies. Birds have been studied on Kasatochi by the U.S. Fish and Wildlife Service continually since 1996, providing a critical data base to evaluate ecosystem impact and long-term recovery. The pre-eruption avifauna on Kasatochi was dominated by over 200,000 crested and least auklets. Williams and others (2010) determined that most, if not all, of the auklet nesting habitat was covered by the eruption products (figure 15). Figure 15. Kasatochi Island auklet rookery seen (a) before the 7-8 August 2012 eruption and (b) after the 2008 eruption, when the auklet hatch had failed completely. Photographs taken by G. Drew, courtesy of Alaska Park Science. The largest direct effect of the eruption on individual animals was likely the mortality of chicks, with an estimated total 20,000-40,000 young birds lost during and shortly after the August 2008 eruption. Drew and others (2010) found that surviving older least auklets around Kasatochi Island showed little change in densities which ranged from 26 to 34 birds per km2. Similar to the least auklet finding, numbers crested auklets were not significantly reduced by the initial explosion. They also returned to attempt breeding in 2009, even though their nesting habitat had been rendered unusable. Although seven species of birds and mammals attempted to breed in 2009, all but one specie failed due to lack of suitable breeding sites. The one successful breeding specie identified was Steller's sea lions. Williams and others (2010) noted the abundance of sea lions and many seabird species in 2009 was comparable to pre-eruption estimates, suggesting that adult mortality was low for these species. In contrast, shorebirds and passerines, commonly called perching birds, that formerly bred on the island were no longer observed in 2009 and probably perished in the eruption. Drew and others (2010) also surveyed the marine environment surrounding Kasatochi in June and July of 2009 to document changes, including nutrient abundance, compared to patterns observed in 1996 and 2003. Analysis of SeaWiFS satellite imagery indicated that a large marine chlorophyll-a anomaly may have been the result of ash fertilization during the eruption. Drew and others (2010) found no evidence of continuing marine fertilization from terrestrial runoff 10 months after the eruption. Post-eruption habitat - volcanic degassing and the landscape. Kasatochi remained quiet except for gas emissions after the 7-8 August 2008 eruption while erosion and deposition have altered the slopes and beaches (figure 16). By April 2009 the level of the crater lake had risen and the lake surface area was 67% larger than it was before the eruption due to an increase in crater diameter (Scott and others, 2010). Fieldwork in summer 2009 determined the locations of various rills and gullies at representative locations on the island. As the gully system on Kasatochi Island began to stabilize and sediment yield declined accordingly, wave action was expected to become the dominant process affecting the landscape (Waythomas and others, 2010). Figure 16. The prominent cliff-like feature (arrow) seen here in this view from the SW sits well inboard of Kasatochi's present coastline. The cliff was the island's former (pre-eruptive) shoreline. At the post-eruptive coastline, surge deposits are 1-2 m thick, and are much thicker higher up on the flanks. This image, taken 23 August 2008, shows gas emitted from the crater, drifting over the crater rim. Lithic clasts up to 2 m in diameter have been eroded out of the pyroclastic flow deposits by the sea and form a boulder-lag deposit along the coastline. Courtesy of Waythomas/AVO. Post-eruptive landscape - drainage density. As stated by Waythomas and others (2010), "A fundamental landscape property that describes the degree of dissection by gullies and stream channels is drainage density... Drainage density is the ratio of total channel length to drainage-basin area [km/km2]. Changes in drainage density with time indicate that the threshold for erosion by runoff has been exceeded during individual rainfall events, and that the drainage system has yet to reach a state of quasi-equilibrium where routine rainfall events no longer bring about appreciable changes in drainage density. Time-dependent changes in drainage density also are surrogate measures of erosion because an increase in channel length must reflect channel head processes such as landsliding or gullying... Eventually the rates of gully development will decline and drainage density will approach a steady-state value or perhaps decrease. This is commonly due to the stabilizing effects of vegetation growth... We note that prior to the 2008 eruption of Kasatochi, the flanks of the volcano were covered with a nearly continuous mantle of herbaceous tundra, and no surface streams or drainages were present. Thus, prior to the eruption, the drainage density was very low, if not zero, and over time, we expect that the island will return to this condition." Based on Waythomas and others (2010) and additional satellite image data from years 2008, 2009, and 2011, Julie Herrick calculated two Kasatochi surface drainage parameters: change in drainage density and change in gully volume. These two calculations used vector images to locate gully lines. These lines were superimposed as vectors on the rasterized (bit digitized) images and then a density analysis was performed. Comparisons of the three years by raster calculations (a form of bit analysis) determined the drainage line density as shown in figure 17A. Spatial analysis determined relative increase, decrease and unchanged surface volumes throughout the island as shown in figure 17B. Figure 17. Two surface models of drainage trends at Kasatochi developed by Julie Herrick. (A) 3D visualization of 9 March 2011 sedimentation drainage line density in units of km/km2 (see text). Colors represent drainage density as shown in the key (bottom left). Notice that the SE and NE sectors have relatively higher densities. (B) Map (N at top of image) showing volume change of 2008-2011 tephra superimposed on a topographic image (legend at right). The relative net loss of volume areas (blue), are mainly on the island's northerly shorelines. The relatively unchanged areas (gray) are near or on the crater rim. The S shorelines have expanded, as shown by the net gain volume areas (red). The recovery of habitats at Kasatochi will depend on erosion of the tephra layer blanketing the island to re-expose former breeding habitats as well as anecdotal introduction of various species. References. DeGange, A.R., Byrd, G.V., Walker, L.R., and Waythomas, C.F., 2010, Introduction-The Impacts of the 2008 Eruption of Kasatochi Volcano on Terrestrial and Marine Ecosystems in the Aleutian Islands, Alaska, Arctic, Antarctic, and Alpine Research, Vol. 42, No. 3, pp. 245-249. Drew, G.S., Dragoo, D.E., Renner, M., and Piatt, J.F., 2010, At-sea Observations of Marine Birds and Their Habitats before and after the 2008 Eruption of Kasatochi Volcano, Alaska, Arctic, Antarctic, and Alpine Research, Vol. 42, No. 3, pp. 306-314. Fee, D., Steffke A., and Garces, M., 2010, Characterization of the 2008 Kasatochi and Okmok eruptions using remote infrasound arrays, Journal of Geophysical Research, 115, D00L10 (DOI: 10.1029/2009JD013621). Jewett, S.C., Bodkin, J.L., Chenelot, H., Esslinger, G.G., and Hoberg, M.K., 2010, The nearshore Benthic Community of Kasatochi Island, One Year after the 2008 Eruption, Arctic, Antarctic, and Alpine Research, Vol. 42, No. 3, pp. 315-324. Neal, C.A., McGimsey, R.G., Dixon, J.P., Cameron, C.E., Nuzhdaev, A.A., and Chibisova, M., 2011, 2008 Volcanic activity in Alaska, Kamchatka, and the Kurile Islands: Summary of events and response of the Alaska Volcano Observatory, U.S. Geological Survey Scientific Investigations Report 2010-5243, 94 p.
Ridling, S., 2012, Origins of Post-Eruption Insect Populations on the Volcanic Aleutian Island of Kasatochi (Presentation, URL: www.akentsoc.org/doc/Ridling_S_2012.pptx). Scott, W.E., Nye, C.J., Waythomas, C.F., and Neal, C.A., 2010, August 2008 Eruption of Kasatochi Volcano, Aleutian Islands, Alaska-Resetting an Island Landscape, Arctic, Antarctic, and Alpine Research, Vol. 42, No. 3, pp. 250-259. Talbot, S.S., Talbot, S.L., and Walker, L.R., 2010, Post-eruption Legacy Effects and Their Implications for Long-Term Recovery of the Vegetation on Kasatochi Island, Alaska, Arctic, Antarctic, and Alpine Research, Vol. 42, No. 3, pp. 285-296. Wang, B., Michaelson, G., Ping, C.L., Plumlee, G., and Hageman, P., 2010, Characterization of Pyroclastic Deposits and Pre-eruptive Soils following the 2008 Eruption of Kasatochi Island Volcano, Alaska, Arctic, Antarctic, and Alpine Research, Vol. 42, No. 3, pp. 276-284. Waythomas, C.F., Scott, W.E., and Nye, C.J., 2010, The Geomorphology of an Aleutian Volcano following a Major Eruption: the 7-8 August 2008 Eruption of Kasatochi Volcano, Alaska, and Its Aftermath, Arctic, Antarctic, and Alpine Research, Vol. 42, No. 3, pp. 260-275. Williams, J.C., Drummond, B.A., and Buxton, R.T., 2010, Initial effects of the August 2008 volcanic eruption on breeding birds and marine mammals at Kasatochi Island, Alaska, Arctic, Antarctic, and Alpine Research, Vol. 42, No. 3, pp. 306-314. Information Contacts: Alaska Volcano Observatory (AVO), a cooperative program of the U.S. Geological Survey, 4200 University Drive, Anchorage, AK 99508-4667, USA; Geophysical Institute, University of Alaska, PO Box 757320, Fairbanks, AK 99775-7320, USA; and Alaska Division of Geological & Geophysical Surveys, 794 University Ave., Suite 200, Fairbanks, AK 99709, USA (URL: http://www.avo.alaska.edu/); Julie Herrick, Global Volcanism Program, Smithsonian National Museum of Natural History, Washington, DC 20560. AVO reported that during 27 August-2 September seismic activity from Kasatochi detected by stations on Great Sitkin, approximately 40 km W, declined. Clouds prevented satellite image observations. The Volcano Alert Level remained at Watch and the Aviation Color Code at Orange. AVO reported that during 20-26 August seismic activity from Kasatochi was detected by stations on Great Sitkin, approximately 40 km W. Clouds prevented satellite image observations. Active fumaroles and hot pyroclastic flow deposits over much of the volcano were observed on 22 August by a visiting scientist. On 23 August, the smell of sulfur was reported in the town of Adak. The Volcano Alert Level remained at Watch and the Aviation Color Code at Orange. AVO reported that during 13-19 August seismic activity from Kasatochi was detected by stations on Great Sitkin, about 40 km W. Clouds prevented satellite image observations. On 17 August, the smell of sulfur was reported in the town of Adak. The Volcano Alert Level remained at Watch and the Aviation Color Code at Orange. On 6 August, AVO raised the Volcano Alert Level for Kasatochi to Advisory and the Aviation Color Code to Yellow based on increased seismicity detected that day by instruments in the area and by field crews on the island the previous few days. Kasatochi lacks dedicated seismometers and is monitored by neighboring networks. On 7 August, earthquake activity continued; events as large as M 5.6 were detected. Crews reported rockfalls, ground shaking lasting 5-10 minutes, and a strong sulfur smell. Periods of volcanic tremor prompted AVO to raise the Volcano Alert Level to Watch and the Aviation Color Code to Orange. Later that day, an ash plume at an altitude of at least 10.7 km (35,000 ft) a.s.l. was detected on satellite imagery drifting SSW. The Volcano Alert Level was raised to Warning and the Aviation Color Code was raised to Red. Reports from a marine vessel in the area indicated ashfall and tephra up to pebble size, spectacular lightning, and total darkness for a little over 2 hours. Three major explosive eruptions produced ash plumes that rose to an altitude of 13.7 km (45,000 ft) a.s.l. Ash emissions became continuous on 8 August following the last explosive event; an ash plume drifted for more than 950 km in a counterclockwise spiral at altitudes of about 9.1-13.7 km (30,000-45,000 ft) a.s.l. Seismicity decreased, although remained elevated, and ash emissions became less frequent. During 8-9 August, seismicity decreased to a level undetectable by stations on Great Sitkin, about 40 km W. On 9 August ash plumes were detected on satellite imagery early in the day; clouds prevented views during the rest of the day. The Volcano Alert Level was lowered to Watch and the Aviation Color Code to Orange. The ash plume from the third eruption on 7 August was seen on satellite imagery 1,850 km ESE of the volcano and was elongated NE-SW over 1,200 km. According to news articles, flights from Alaska to several west coast cities were cancelled on 10 and 11 August. During 10-12 August, AVO reported that seismicity remained low, but detectable by the network on Great Sitkin. Kasatochi, which apparently had not erupted during the last century, erupted explosively with little warning on 7 August 2008. The island is generally uninhabited, ~ 3 km in diameter, and lies ~ 800 km W of the tip of the Alaska Peninsula (figures 1 and 2). The eruptive history of this volcano includes several unconfirmed eruptions in the 1800's, and a small confirmed eruption in 1760. Much of the information in this report was taken from the Alaska Volcano Observatory (AVO) website or provided by John Eichelberger of the U.S. Geological Survey (USGS). No seismic or other geophysical monitoring instrumentation is present on Kasatochi. Seismic networks reside on neighboring islands, such as Great Sitkin Island ~ 40 km W.
Figure 1. Map of Aleutian Islands showing locations of active volcanoes, including Great Sitkin, Kasatochi, Cleveland, and Okmok. Map prepared by Seth Snedigar, AVO/Alaskan Division of Geological and Geophysical Surveys. Figure 2. Photograph of Kasatochi as it appeared in 1961. The crater diameter was ~750 m. The (pre-eruption) crater-lake surface was less than 60 m above sea level. Courtesy of Dan Rogers, AVO/USGS. The first indication of activity on Kasatochi was around 2 August 2008, when a U.S. Fish and Wildlife Service (USFWS) field crew of two biologists on the island experienced continual small tremors. On 6 August, for a period of about 12 hours during the morning and afternoon, the AVO noted a rapid increase in earthquakes on the island. On the evening of 6 August, AVO elevated the aviation color code/volcano alert level to Yellow/Advisory. By 7 August 2008, the number and magnitude of earthquakes increased, accompanied by volcanic tremor. Earthquakes as large as M 5.6 were detected. On the morning of 7 August, the field crew reported periods of continuous ground shaking lasting 5-10 min, as well as numerous rockfalls and a strong sulfur odor. Between approximately 1400 and 2035, three major explosions occurred. According to satellite data, ash reached an altitude of at least 13.7 km in the vicinity of Kasatochi, and drifted SSW. The two biologists (Ray Buchheit and Chris Ford) were conducting a summer-long study of seabirds and living in a cabin on the island. According to Rozell (2008), the two were rescued by a charter boat captain only hours prior to the 7 August eruptions. After the earthquakes and other signs on the morning of 7 August, the biologists radioed their contact in Adak to explain the situation. The two fueled up their skiff and were prepared to jump in and follow a GPS course to Great Sitkin Island, heading across rough seas ~ 40 km W. But the refuge staff chartered a larger boat from Adak, which succeeded in getting the biologists off the island and to safety. Between 2100 and 2300 on 7 August, observers from a ship near Kasatochi reported ashfall with tephra up to pebble size. They noted spectacular lightning, thunder, and total darkness during this time. In response to this eruptive activity, AVO elevated the aviation color code/volcano alert level to Orange/Watch and then to Red/Warning. Ash emissions became continuous following the last of the three explosive events of 7 August, and (downward looking) satellite imagery disclosed a continuous ash cloud bent in a counterclockwise spiral. By 8 August, that plume had extended SE for more than 950 km at an altitude exceeding 10.7 km (figure 3). Figure 3. Image of plume from Kasatochi captured 8 August 2008 by the Moderate Resolution Imaging Spectroradiometer (MODIS) on NASA's Terra satellite. The bright clouds provide good contrast for the volcanic plume, which is dark brown. Weather patterns caused the plume to bend counterclockwise. Courtesy of NASA Earth Observatory. The eruption continued through 8 August and satellite imagery continued to detect a plume from Kasatochi until slightly after midnight on 9 August. By the morning of 9 August, seismicity declined and ash emissions were not observed in either satellite data or from pilots or passing mariners. The drifting SO2 plume was seen on satellite imagery 1,850 km ESE of the volcano. The plume was elongated NE-SW over a distance of 1,200 km. During the days after 9 August, eruptive activity declined gradually. Seismic activity persisted at least through 5 September. The ash cloud produced during the previous week had detached and spread out over North America and was beginning to extend over parts of the North Atlantic. The distribution of gases and aerosols no longer appeared as a single intact cloud. According to news reports on 10 and 11 August, Alaska Airlines had cancelled over 40 flights into and out of Alaska because of the ash plume. One report from Reuters stated that Alaska Airlines cancelled 44 flights. Those cancellations affected more than 5,200 passengers. According to an Anchorage Daily News report on 10 August, a member of Alaska Airlines staff was reported as saying, "The entire state is unflyable." The total number of flights cancelled by this and other carriers is unknown. Occasional earthquakes and periods of tremor continued to be recorded. During 17-19 August, the smell of sulfur was reported from Adak, about 85 km SW of Kasatochi Island. Active fumaroles and hot pyroclastic-flow deposits over much of the volcano were observed on 22-23 August by visiting scientists (see below). On September 3 and 4, passing mariners observed vigorous steam and gas plumes rising above the crater and extending up to ~ 30 km downwind. On 4 September, the aviation color code/volcano alert level was reduced to Yellow/Advisory. Sulfur dioxide measurements. On the days following the eruptions, the Ozone Monitoring Instrument (OMI) on NASA's Aura satellite tracked a dense cloud that contained about 1.5 megatons (million tons) of sulfur dioxide (SO2). This was one of the largest volcanic SO2 clouds scientists have observed from satellite measurements since the 1991 Pinatubo eruption in the Philippines. However, some fraction may be due to increased instrument sensitivity achieved since that time. The three panels comprising figure 4 depict the early distribution of Kasatochi's SO2 plumes. The 8 August 2008 OMI image shows a highly-concentrated SO2 distribution E and SE. By 10 August the SO2 cloud had become elongate and sinuous, and had detached from the source. It extended S and SW but a long NW projection reached mainland Canada where it spread N and S to Alaska and Washington state. The zones of greatest SO2 concentration on 12 August appeared near the Yukon-Alaskan border. Areas of lower concentrations were complex but covered much of Canada and adjacent coastal areas at least as far as Greenland. A small outlier (not shown on map) was also present between Greenland and Iceland. The detached trailing edge resided over the N Pacific but farther S than in previous images. Figure 4. The SO2 cloud as measured by Ozone Monitoring Instrument (OMI) on NASA's Aura satellite on (top) 8 August 2008, (middle) 10 August 2008, and (bottom) 12 August 2008. Winds were moving the gas in a large counterclockwise loop over the Pacific Ocean and back toward Alaska, but also spreading streamers over the Arctic and eastward across the United States and Canada. Note the different scales for each image. A Dobson Unit is a commonly used measure of the concentration of a gas in a 15-km tall column of the atmosphere. Images courtesy of Simon Carn. Post-eruption visit. On 22-23 August 2008, Chris Waythomas (USGS/AVO) and Ray Bucheit (USFWS) visited the volcano. They observed numerous active fumeroles and hot pyroclastic-flow deposits. The entire island had been swept by surges and pyroclastic flows. Pyroclastic-flow, -surge, and fall deposits, in places containing boulders up to 2 m across, formed a new shoreline well beyond the pre-existing sea cliffs (figure 5). The visitors found no signs of life remaining on the island. The island's isolated ecosystem, which had been monitored by USFWS since the 1930s, had been totally destroyed. Figure 5. Fresh deposits of pyroclastic material form a new shoreline at Kasatochi. Courtesy of Chris Waythomas and Ray Bucheit. Figure 6 shows the extent of island's new shoreline and the new crater rim compared to the island's pre-eruption morphology. Newly deposited material extended the shoreline in a low-lying band around most parts of the island, in some places, ~ 300 m outboard of the pre-existing sea cliffs. In general, the crater rim expanded, particularly on the W side where it enlarged by ~ 200 m. A crater lake remained; and vents in the S crater were identified. During the visit, fresh slumps were apparent in fresh deposits perched on the crater rim and smaller "secondary" surge deposits were identified (figure 7). Figure 6. New shoreline (outer boundary) and new crater rim (inner boundary) found after the 7 August 2008 eruption of Kasatochi. The background (base) is a satellite image from April 2004 (Copyrighted by Digital Globe). Courtesy of John Eichelberger, USGS. Figure 7. Aerial view of Kasatochi's crater rim, taken at 1152 on 22 August 2008 (with crater rim and upper wall cutting diagonally across the photo's left corner and the surface of freshly deposited tephra occupying most of the rest of the photo). During the visit, small (secondary) ash clouds and surges (light-colored areas) were produced by slope failure (in direction of at arrows down the crater wall). Photo courtesy of Chris Waythomas (AVO) and Ray Bucheit (USFWS). Thermal anomalies. According to David Schneider of AVO, thermal anomalies at Kasatochi were visible using a combination of MODIS, AVHRR, and GOES satellite sensors; increasing the number of satellite observations per day reduces the chance of missing anomalies due to cloud cover. The Hawai'i Institute of Geophysics and Planetology (HIGP) Thermal Alerts System measured no MODIS/MODVOLC thermal anomalies at Kasatochi during August and early September 2008. AVO measured thermal anomalies through breaks in the clouds on 5 September 2008 and during a relatively clear day on 7 September. Information Contacts: Alaska Volcano Observatory (AVO), a cooperative program of the U.S. Geological Survey, 4200 University Drive, Anchorage, AK 99508-4667, USA; Geophysical Institute, University of Alaska, PO Box 757320, Fairbanks, AK 99775-7320, USA; and Alaska Division of Geological & Geophysical Surveys, 794 University Ave., Suite 200, Fairbanks, AK 99709, USA (URL: http://www.avo.alaska.edu/); Hawai'i Institute of Geophysics and Planetology (HIGP) Thermal Alerts System, School of Ocean and Earth Science and Technology (SOEST), Univ. of Hawai'i, 2525 Correa Road, Honolulu, HI 96822, USA (URL: http://modis.higp.hawaii.edu/); NASA Earth Observatory (URL: http://earthobservatory.nasa.gov/NaturalHazards/); Simon Carn, Joint Center for Earth Systems Technology, University of Maryland Baltimore County (URL: https://so2.gsfc.nasa.gov/); Portland Business Journal (URL: http://portland.bizjournals.com/portland); Reuters (URL: http://www.reuters.com/). The Global Volcanism Program has no synonyms or subfeatures listed for Kasatochi. 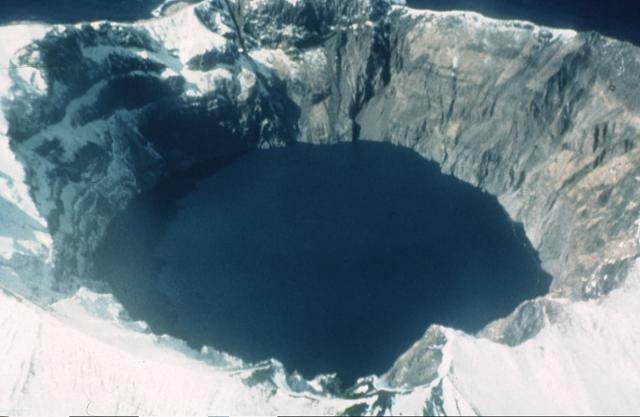 Located at the northern end of a shallow submarine ridge trending perpendicular to the Aleutian arc, Kasatochi is small 2.7 x 3.3 km wide island volcano with a dramatic 750-m-wide summit crater lake. The summit of Kasatochi reaches only 314 m above sea level, and the lake surface lies less than about 60 m above the sea. A lava dome is located on the NW flank at about 150 m elevation. The asymmetrical island is steeper on the northern side than the southern, and the volcano's crater lies north of the center of the island. Reports of activity from the heavily eroded Koniuji volcano to the east probably refer to eruptions from Kasatochi. A lava flow may have been emplaced during the first historical eruption in 1760. A major explosive eruption in 2008 produced pyroclastic flows and surges that swept into the sea, extending the island's shoreline. There is no Deformation History data available for Kasatochi. A dramatic 750-m-wide crater filled with a salt-water lake truncates the summit of Kasatochi volcano. Steep-sided crater walls rise to a maximum elevation of 314 m above the lake surface, which is less than 60 m above sea level. The volcano is located at the northern end of a shallow submarine ridge trending perpendicular to the Aleutian arc and occupies a small 2.7 x 3.3 km wide island volcano. Reports of activity from the heavily eroded Koniuji volcano to the east probably refer to eruptions from Kasatochi. Photo by Dan Rogers, 1961 (courtesy of Alaska Volcano Observatory, U.S. Geological Survey). There are no samples for Kasatochi in the Smithsonian's NMNH Department of Mineral Sciences Rock and Ore collection. Large Eruptions of Kasatochi Information about large Quaternary eruptions (VEI >= 4) is cataloged in the Large Magnitude Explosive Volcanic Eruptions (LaMEVE) database of the Volcano Global Risk Identification and Analysis Project (VOGRIPA).